This slightly unorthodox salsa is amazingly refreshing; the mango lends a bright sweetness while the cucumber adds some texture and crunch. Eat by the spoonful (as I do) or serve with chicken skewers, fresh corn and a citrusy cocktail for a festive summer meal. 1. 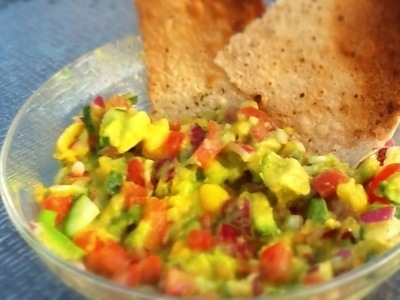 Finely dice mango, avocado, onion tomatoes, green onion and cucumber. Try to resist eating this all by yourself. Add a jalapeño for some kick.